The Yankees’ holiday shopping has been star-studded, expensive and controversial. The price tag of the four costliest new contracts – Jacoby Ellsbury, Brian McCann, Carlos Beltran and Hiroki Kuroda — is roughly $300 million. And yet the Yankees’ offseason grade remains, at best, an Incomplete. Now that the winter meetings are over, it’s helpful to look at the Yankees’ roster – or any team’s roster, for that matter — and ask what their lineup and pitching staff would look like if they needed to play a game today. By that measure, the 2014 Yankees don’t look that much better than the injury-ravaged edition that won 85 games this year. Yes, the Yankees are certain to score more than the 650 runs they produced this year — their lowest output in more than two decades. Outside of losing embittered second baseman Robinson Cano to Seattle, the changes are net positives: McCann for Chris Stewart at catcher; Ellsbury, Beltran and Alfonso Soriano (a late-season trade) for Vernon Wells, Ichiro Suzuki and Travis Hafner across the outfield and designated hitter spots. But while general manager Brian Cashman’s moves have been defensible, he has done little to address a mediocre pitching staff. The roster still has too many aging, declining, injury-prone players. In an American League East with the defending world champion Red Sox and perpetually competitive Rays, the Yankees’ path to October involves an uncomfortably high number of baseball miracles. Look at the infield using the aforementioned game-in-December test. Shortstop Derek Jeter (17 games in 2013) and first baseman Mark Teixeira (15 games) are penciled in for everyday roles after missing nearly all of this year with injuries that involved surgery. Cano’s tentative replacement at second is journeyman Kelly Johnson; the Yankees offered free-agent infielder Omar Infante a three-year, $24 million contract before he signed with the Kansas City Royals. Then there’s third baseman Alex Rodriguez, who could miss the entire season because of a performance-enhancing drug suspension. 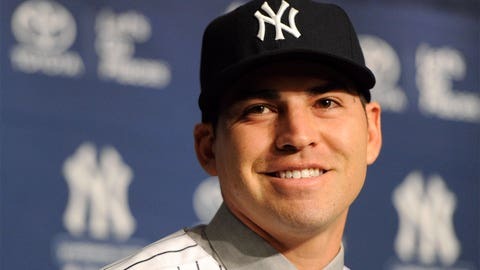 The Yankees would benefit financially if they don’t have to pay his $25 million salary. But then they’d need to replace him – at a position where they lack options. A-Rod is the only player on the 40-man roster who started more than 20 games at third base in the majors this year. The greatest worry, though, is on the mound. Kuroda’s return was essential; he’s one of only 10 pitchers to average at least 200 innings over the past three seasons while maintaining an ERA below 3.25. He has been the Yankees’ best pitcher during that time — a distinction that once belonged to CC Sabathia, who’s coming off the worst season of his career (14-13, 4.78 ERA). At present, the Yankees’ rotation ranks no better than third in the AL East. (The Rays could trade David Price, as expected, and still have a superior starting five.) It’s hard to imagine the Yankees contending unless they land a high-end free-agent starter: Masahiro Tanaka (if he’s available via the posting system), Ervin Santana or the mercurial Matt Garza. That would allow Ivan Nova, who had an encouraging second half, to settle in as the No. 4 starter, while Adam Warren, Vidal Nuno and Michael Pineda participate in a spring derby for the fifth spot. We should be able to mention the possibility of Cashman dealing for a top-of-the-rotation arm like Price or the Cubs’ Jeff Samardzija, but the Yankees’ most-hyped prospects (Tyler Austin, Mason Williams, Slade Heathcott, Manny Banuelos and Dellin Betances) have suffered injuries and/or performed below expectations in recent years. In terms of the franchise’s long-term health, that story might be even more important than losing Cano to the Mariners. With a better farm system, the Yankees could field a championship-caliber team for less than their mythical $189 million payroll limit. They would be able to promote a low-cost replacement for Cano or package a few prospects for the ace pitcher they covet. Instead, they’re faced with the possibility of spending more than $100 million on Tanaka. That’s the penalty of failing to develop high-impact talent. The bullpen is a concern, too, as the Yankees face their first season without Mariano Rivera in nearly two decades. Even if they’re ready to turn to in-house candidate David Robertson as Rivera’s successor, the Yankees need to add two late-inning arms between now and Opening Day. Yes, right-handers Shawn Kelley and Preston Claiborne have shown promise. But if Kelley and Claiborne are ready for more prominent roles — which is far from certain – manager Joe Girardi must find new relievers to account for the middle innings they threw in 2013. And for a newly budget-conscious franchise, this is a bad winter to be looking for relief help. The high guarantees for free agents Joe Smith ($15.75 million) and ex-Yankee Boone Logan ($16.5 million) tell you that much. Are the Yankees having a bad offseason? No. Cashman is doing a fine job. But his work is far from over. Rare is the team that spends $300 million and remains this far from looking like a viable contender.